Welcome back to another edition of Cookie Bookie, the week long celebration of nail-biting stories and mouth-watering treats. If you weren't here yesterday, scroll down for Agatha Christie's Suprise, Surprise and some suprisingly delicious chocolate cookies. Can this pulp fiction even count as our proper Jane Austen now? I'm not sure. Have you read Pride and Prejudice and Zombies yet? It's gruesome, but I couldn't resist. Elizabeth Bennett stretches beyond proud and witty literary heroine to become bonafide bad-mama zombie fighter. The notion is amusing. If you think you enjoyed her pithy banter with Mr. Darcy, wait until she uses her muscles to express her annoyance. Hi-ya! But...after awhile I got a bit bored with the slash um' up gimmick. It just couldn't hold my attention in the effortless way that a true Austen can. Still, I did get more than one good chuckle out of it. Listen to the first line...."It is a truth universally acknowledged that a zombie in possession of brains must be in want of more brains." 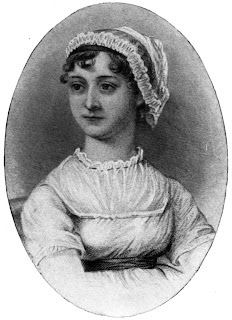 Fans of Austen will remember the first line of the true Pride and Prejudice as "It is a truth universally acknowledged, that a single man inpossession of a good fortune, must be in want of a wife." Pride and Prejudice and Zombies is not for the squeamish, but it will do well enough for those who want to be scared silly. Whichever Austen (or Austen-ish) book you choose to devour this October, I've got the perfect treat as a companion: A tender brown sugar bar cookie, studded with toasted pecans and tempered with a slightly salty maple glaze. It's a little fancy, a bit on the high brow side, since Austen deserves our utmost respect (tut, tut). But it's also playful, with a little touch of salt thrown over the top, to ward off superstition. Just in case the macabre really is lurking around the darkest corner of your attic. Mwah, ha, ha. Until tomorrow. Preheat oven to 350 degrees. In a large bowl, combine sugar, butter, and maple flavoring. Add eggs and mix until well combined. add baking powder and salt. Stir in flour, then nuts. Pour into greased 9 inch square baking pan. Bake at 350 degrees for about 30 minutes or until a toothpick inserted into center comes out clean. Cool on wire rack. Prepare glaze by combining butter and powdered sugar. (Mixture will be a little lumpy.) Slowly stir in cream, as needed. Stir until smooth. Add maple flavoring. Pour glaze over almost cool bars. Sprinkle with pecans and salt. Serves nine. Send your friends over to join in the fun. Become a Follower by clicking on the upper right link. I love Northanger Abbey and those maple bars look delicious. I Iove sweet with a little bit of salty. Thanks for another great reading suggestion and recipe. Have a great day! Are you and your kids on Fall Holiday? You're trying to blow my diet! I'm with Michal. Yes on Northanger Abbey, No on the Zombie Pride and Prejudice, and Yes on the maple bars. Here's another PS that you'll get a kick out of. When I bought the fabric and the eyelet, the girl who cut the fabric for me and the girl who rang me up both asked what I was making, I told them both, "bloomers" and both of them, BOTH of them, thought I was making them for ME!!! Catte, really? For you? They probably think you're a crazy UT Mormon that wears pioneer garb at home all day. ha, ha! I love the black bloomers. Now I'm wondering where Sailor's are. Hmmm. They are really cute under winter dresses with black tights and a black petticoat. I remember how cute Sailor's black bloomers looked under her Christmas dress. I loved it. But my black bloomers didn't turn out that great. I wanted them to be the same shape as Sailor's black one's but the legs are too wide, so they look like the shorter style and that I made them too long. They're kind of funny looking, but I didn't have a pattern. Actually you probably didn't have one either, if I know you. =D But yours turned out darling. Maybe after Halloween I'll cut some of the length off and hopefully they'll look more like her white ones. I adore the combination of brown sugar and maple - those bars look amazing! 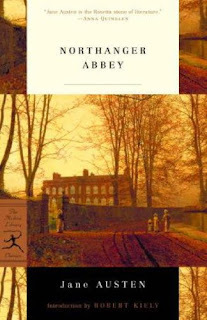 I have read a lot of Jane Austen books, but never Northanger Abbey. I'm putting it on my list. Have you read "Jane Slayer"? 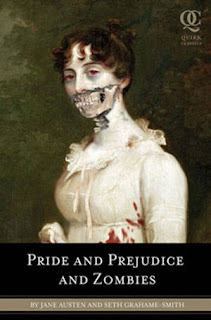 Similar to "Pride and Prejudice and Zombies" it's much more intersting to read. Jane Eyre as a vampire slayer is suprisingly believable. Awesome post!!! Really enjoyed this post. But I want more information on such valuable topic . I also do agree with the stuff you shared, Thanks that's a wonderful post.